Buy FlipFour Néstor Games Edition? Welcome to Masa's world! FlipFour is a game to create four pieces in a row, with the least number of pieces for a player, which is just "four!" FlipFour is an abstract strategy game for 2 players invented by Masahiro Nakajima, the Curator of The Museum of Abstract Strategy Games, in 2016. A 5x5 board, 4 white pieces and 4 blue pieces. See below Fig. Pieces are double-faced: A red cross is shown on one face and a black cross on another. The Red cross is for Rook, and the Black cross is for Bishop. The board starts empty. Players take all 4 pieces of her color (white or blue). White starts first. The first player who placed her all 4 pieces in a row (vertically, horizontally, or diagonally) wins. 4 pieces can be Rook or Bishop, either way. Players take turns either placing one of her new piece on the board or moving one of her pieces already on the board. New pieces can be placed on empty cells, either Rook face up or Bishop face up. Pieces are flipped (Rook becomes Bishop, and Bishop becomes Rook) every time it is moved. 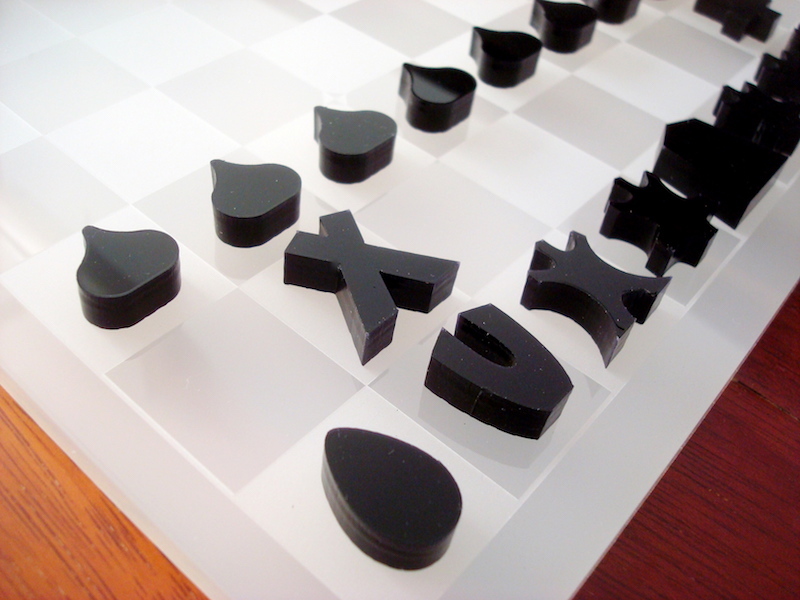 Players can move their pieces before placing all their pieces on the board. Copyright © Masahiro Nakajima 2016, www.nakajim.net 2016, All rights reserved.